Three years ago, I got this wild idea that I wanted to run the Siskiyou Outback (SOB) 15k trail run near the Oregon/California border. The run is an annual event in July and since I start bowhunting elk at the end of August, the SOB seemed like good motivation to get in shape for chasing elk in the high country. Fifteen kilometers = 9.2 miles. Hey, that’s a reasonable distance, but the SOB has something extra special: altitude. I live at 240 feet above sea level and like to hunt elk above 6,000 feet. The SOB starts around 6,500 feet and goes up from there. Terrible. I mean, perfect! So, I started training for the SOB 15k three years ago. I ran trails, I ran hills, I was a regular Forest Gump. I bought trail running shoes. I ran like crazy. I was all fired up and then three weeks before the race I was running with my best-good-golden-retriever-buddy, Banjo, out at Hagg Lake. Forty minutes into the run, I took a long stride down a short descent and as my foot hit the dirt, it was as if the ground just wasn’t there… my ankle rolled under and I went down like a bag of bricks. My ankle was best described with a word that starts with an F and ends with a D and I don’t mean “farmed”. It was crutches and physical therapy for me and no SOB 15K. Over the next couple of years, my running got better and worse, then better, then worse… I was running, but it wasn’t great. It wasn’t where I wanted it to be and while I was in good enough shape to hunt elk, I wasn’t in the kind of maddog physical condition I wanted to be in. 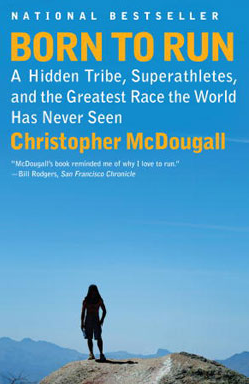 Then I read the best-selling book, Born To Run, which chronicles the author’s seemingly miraculous running journey from being continually injured to becoming an ultra runner (“ultra” means running distances longer than a 26.2 mile marathon). The author did it with the help of ultra running coach, Eric Orton. I figured what I was doing always seemed to end in injury, so why not try something new? Eric’s regimen was nothing like I’d ever seen before. He preached a style of running where the ball of your foot hits the ground first. No more heel-toe action. Okay, it sounded weird but why not? It was October 2011 and even though I left college over 20 years ago, I gave it that old “college try”. I will spare you the gorey details and just say that running with a fore-foot strike is murder on your calves when you first start out. You don’t just completely change your running style and expect your body to adjust overnight. Eric’s beginning routine called for short, barefoot runs too. After about three weeks, I thought my calves were going to fall off. I gave them a rest, then started running again, then stopped again, and by January I was able to start and not have to stop. The workouts consisted of lots of really slow running with as many short steps as you can cram into a 15 second interval (the goal is 23 for each foot). Ten minute barefoot runs on grass. All running governed by a heart rate monitor. Things were going great until one day I decided to deviate from the program. Eric said to do the barefoot runs on short, manicured grass and I decided to get crazy and spice things up in the long grass. Sure as you know what, I took a bad step. It was so subtle that I barely noticed. I finished the run, cooled down, sat down, and then I couldn’t walk. My right ankle was fried. Air cast, crutches, rest. 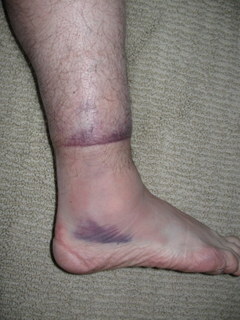 But unlike three years earlier, my ankle came back to strength in a hurry. I was off crutches in a week and running again in a month. There’s a method to Eric’s madness: strengthen the foot and use the forefoot strike as a way to use your whole leg as a shock absorber instead of your heel. When the foot is strong, you run strong. I signed up for the SOB 15k in March and never looked back. This entry was posted in Elk Hunt, Hunting, Physical Conditioning, Running and tagged born to run, elk hunting, eric orton, get in shape, goat hunter, goathunter, hunting, matt alford, physical conditioning, running, siskiyou outback, SOB, training. Bookmark the permalink.